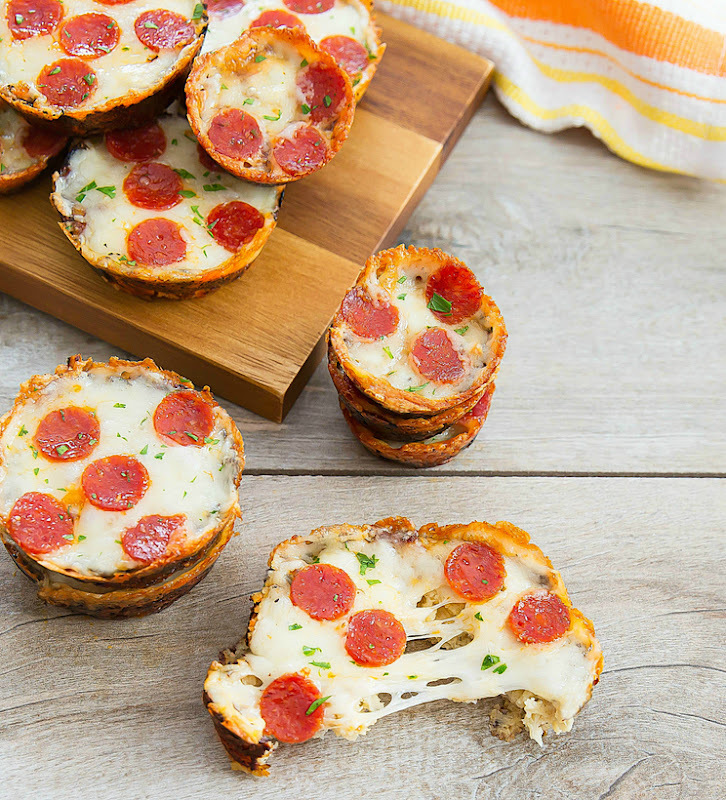 These low carb pizza muffins start with a cauliflower base. It’s similar to cauliflower crust pizza, but much less work and in a portable muffin form. Cauliflower was on sale recently and I stuffed my fridge full. 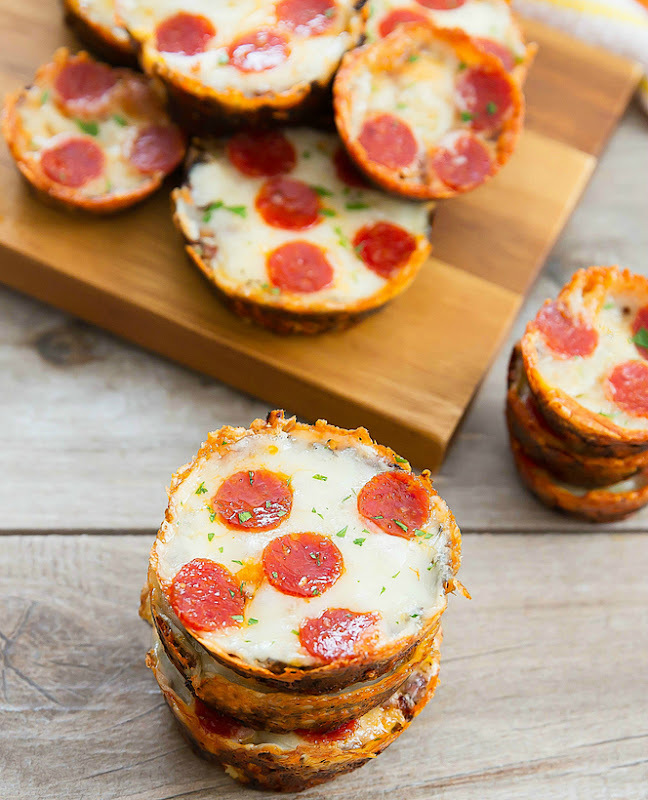 I was racking my brain for a new cauliflower recipe and I came up with these pizza muffins, which are like a low carb form of my pizza cupcakes. Today was a total bust. I’m sure you’ve had those days–where you have all these plans set out and then something happens and it messes up your entire schedule. This morning started with Mr. K unable to start his car. Why is it that car batteries rarely give any sign that they are about to stop? And, as I already learned once before, the problem with my husband and I both owning hybrids, is that we don’t have a vehicle to jump start the dead car. Thank goodness for neighbors. Anyhow, we finally got his car started, but it did take up most of our morning, really setting us back for the rest of the day. After we finally got the car fixed, I made another batch of these cauliflower pizza muffins because I really needed a treat. This is my second batch this week! The muffin is made with a similar recipe as cauliflower pizza crust. However, instead of wringing the cauliflower dry, I actually dried it by cooking it in the microwave. It’s much faster and less messy. Normally cauliflower pizza crust is made to be very thin, so that it completely crisps up. 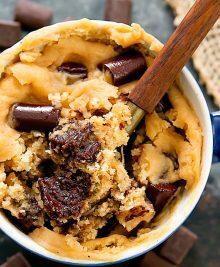 When packed in muffin tins, they are a softer, but still quite delicious. The cauliflower flavor is a little stronger for these muffins because I reduced the amount of cheese in the muffins since I would be adding more cheese on top for the pizza. By the way, what happened to mini pepperoni? I used to be able to find them everywhere and now I rarely see them at the grocery store. I actually had to cut my own mini pepperoni for these muffins. I’m really sad that mini pepperonis are hard to find now. I can’t imagine them not being popular. Who doesn’t love something so cute? 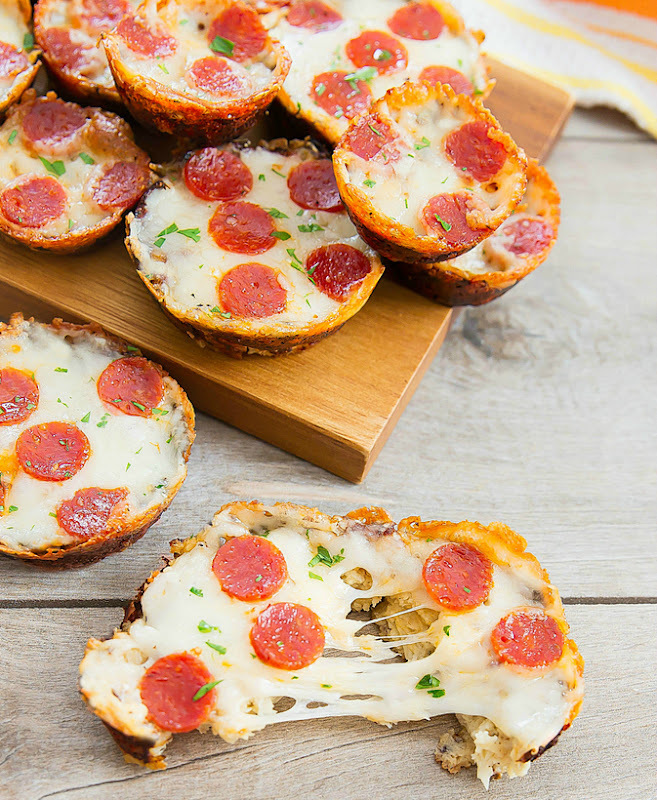 These low carb pizza muffins start with a cauliflower base. It's similar to cauliflower crust pizza, but much less work and in a portable muffin form. Preheat oven to 425°F. Line a standard muffin/cupcake tin with 9 cupcake liners. I'm a huge fan parchment cupcake liners (see notes) which is what I used because they are non-stick. Make sure you line your pan rather than bake directly into them. I found that baking directly into the pan causes the edges to get slightly burned and also some of the muffins are difficult to remove. For this recipe, I dried out the cauliflower through the microwave. See the notes for the steam method if you would rather do that. Place cauliflower into large microwave-safe bowl and microwave for 2 minutes. Stir cauliflower to mix up the bottom and top cauliflower. Place back into the microwave and cook for another 3 minutes. My cauliflower took another 10 minutes of cooking to dry (so 15 total), but your time may vary depending on your microwave. Make sure you stop every 2-3 minutes to stir and mix, so none of the cauliflower gets overcooked. 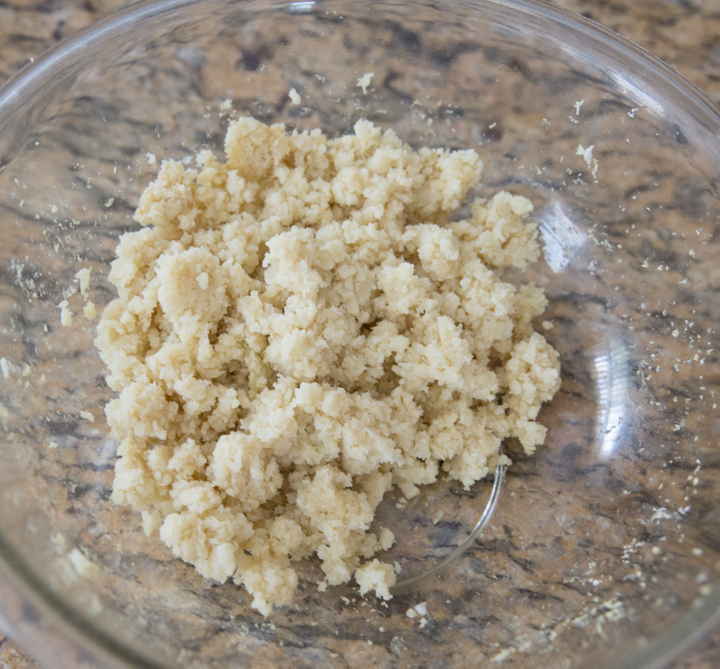 When it is done, cauliflower should still be slightly moist to the touch, but should look dry, slightly darker in color, and clumped up, similar to as if someone had chewed it up and spit it back out. If you've made cauliflower pizza or breadsticks with the cloth wringing dry method, it should look the same. Add in egg, cheddar cheese, and seasoning. Stir until everything is thoroughly combined. Fill muffin tins about halfway full, pressing down slightly to even the surface. Bake cauliflower muffins for about 15-18 minutes or until the surface is golden brown. Remove from oven and sprinkle muffins with the shredded mozzarella cheese, covering the entire surface of each muffin. 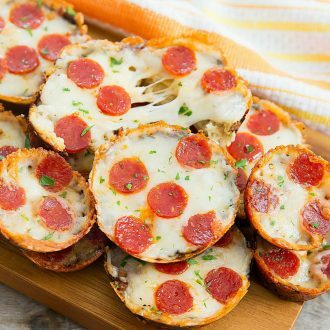 Place about 5 mini pepperonis on top of each muffin. Reduce oven to 400°F. Place muffins back into the oven and cook about 5 minutes, or until top layer of cheese is bubbly and melted. Serve immediately. 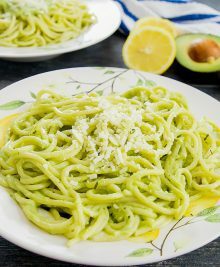 Garnish with fresh chopped parsley or a sprinkling of Italian seasoning if desired. You can also serve these with some marinara dipping sauce. I put the florets through a food processor until they resemble large crumbs, about half the size of a grain of rice. I used parchment cupcake liners* that I buy on Amazon. I like to use the microwave method to cook the cauliflower, however, if you prefer to steam and wring with a cloth to dry, check out my wringing instructions here. I’ve seen mini-pepperoni packs at a couple of different Targets in North County over the past couple of weeks, so they are still made and sold. thanks for the tip! I’ll have to look next time I’m at Target. These look yummy, but wonder why when you make something this healthy why you would use pepperoni on top. Red peppers, black olives, mushrooms, I would think would be much better and much healthier. I’d love to try this with my students. 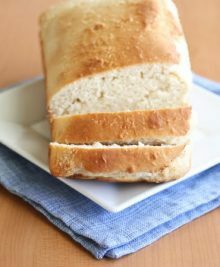 I’m wondering about processing the cauliflower on one day and then baking the next day. Any tips? Perhaps you can try freezing the cauliflower after you pulse it? And then bringing back to room temp before using it. I’ve tried pulsing the day before and putting it in the fridge. The cauliflower tends to dry out when I did that, so I don’t recommend it. So you process the cauliflower then dry it in the microwave? And would it be okay to bake them in silicone cup liners?